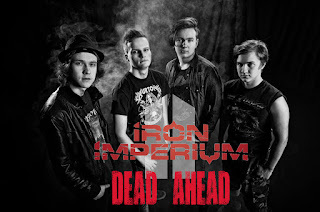 Iron Imperium (Hierro Imperio) libera video musical y un solo "Dead Ahead"
El hierro es Imperium banda alternativa- / heavymetal de Jyväskylä, Finlandia formada en 2012, quienes la música es inspirado por bandas como Avenged Sevenfold, System of a Down y 'heavymetal de 80. la lírica de la banda nada en las aguas oscuras. La banda podría ser descrito como metal moderno, entre las que se tiene un poco de metal de los años 80, la oscuridad, y el grunge, pero aún así es un metal música enérgica y honesta. Iron Imperium releases music video and a single "Dead Ahead"
Iron Imperium is alternative-/heavymetal band from Jyväskylä, Finland formed in 2012, whom music is inspired by bands like Avenged Sevenfold, System of a Down and '80's heavymetal. The band's lyric poetry swims in the dark waters. The band could be described as modern metal, among which has a little bit of 80's metal, darkness, and grunge, but still it is an energetic and honest metal music.